The beautiful Isle of Skye has not only produced fine music, cattle & whisky, but also us........the Skye MacPhersons. This website is aimed to allow our families to record their histories and their lives and provide a place to view photographs that explain who and where we are. It has been spawned from a gathering, which took place on Skye in September 2012. 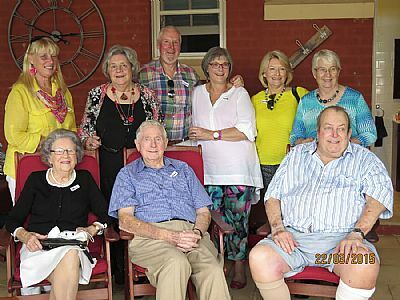 Another reunion took place in New South Wales in 2015 between descendants of Duncan  & Mary (Macdonald) McPherson, who emigrated from Sleat to Australia in 1854. Family history is arranged by generation, starting with, our earliest recorded ancestors, Duncan & Mary McPherson. They are included within Early Recorded Generations 1-3, together with their children and grandchildren, the latter born about the 1820s. Only those 'lines' who have living (known) descendants are described in detail. Generations 4 & 5 cover Duncan & Mary's great, and great great, grandchildren, the latter born about late19thC. For reasons of privacy, later generations are not covered. Documents contained on the Library Page (see left Menu) can be downloaded. Also click on underlined & highlighted (normally in blue) text for direct link to a specific document. By placing the cursor on an image, a caption title will appear. The Generations Chart shows the linkages between the Generations 1-5. The website text has cross-references to the unique individual numbers in the Chart. The spelling of the surname has changed throughout the years, and has also differed amongst siblings. The website has been revised so that McPherson is used, unless there is documentary evidence of a different usage by an individual...this will largely affect the latest generation covered. Present day usage appears to be MacPherson or Macpherson. The website relies on contributions by way of genealogical information, family stories, documents and photographs. If you wish to contribute or you have a query or comment, please use the Feedback link.